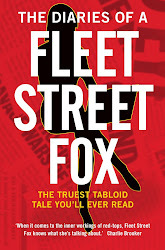 fleet street fox: Hope springs. THERE are days when you wonder why humanity bothers. When a man in charge of a bank is expected to act like a vicar; when prices go up and quantity goes down; when a man arguing for his nation's independence says he wants to keep the Queen as head of state; when a woman is criticised for wondering if she can do a better job than the current ham-fisted leader of her political party; when a gap-toothed Denise Welch flashes her bra at photographers (not included here because I'm eating my lunch). Quite often though there is a story which, due to the fact stupid people always get more notice, attracts less attention but ought to be shouted about from the rooftops. 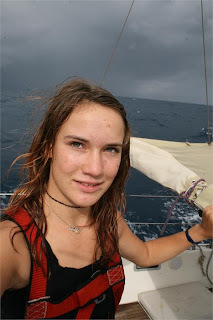 Two years ago Laura Dekker, then aged 14, announced that she wanted to circumnavigate the globe. She had wanted to do so since she was eight and her dad, quite reasonably, told her not to be so daft. Eventually she wore him down and he agreed to support her. She had spent her whole life on boats anyway and he trained her in a few extra things, she sought and got sponsorship for herself and between them they fitted up a vessel for her. When she told her school she wouldn't be back next term because she was sailing around the world, social services were called and a big court battle ensued. Laura's mother was understandably terrified for her, the authorities insisted it was certain death, and at one point Laura was so upset she cut herself and was taken to hospital. Another time she ran away to St Maarten in the Caribbean. Eventually the court decided that, if psychologists and sailing experts said Laura was up to the challenge, the decision to let her go was her parents' and not that of the state. The parents agreed, Laura took courses on how to suture her own wounds and promised to keep in regular radio contact, and off she sailed. This girl covered 27,000 miles. She fixed her own rudder when it broke, did her homework, survived on 20-minute catnaps in busy waters and had to overcome waves in the Southern Ocean bigger than the average house. She survived extreme conditions, on her own, and apart from blogging it largely to keep sponsors and family happy has totally shunned the celebrity and attention her achievement has thrown her way. She circumnavigated the globe. On her tod. Sir Francis Drake would sit there with his mouth open if he knew. You can look at this in one of two ways: either she has taken the teenage strop to new and impressive levels, or she's virtually a mermaid. In either case she's utterly, completely, inspiringly brilliant. She has conquered difficulties most of us can't imagine and is still only 16. SIXTEEN. When I was her age I looked like Cousin It and spoke in grunts. She doesn't know what she wants to do next, apart from her school exams. But whatever it is, I'll bet my brush it's going to be something absolutely amazing. Hats off to a spotty kid who's going to be an awesome woman.